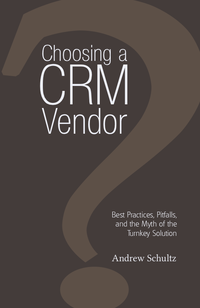 In Choosing a CRM Vendor, Andrew Schultz shares both his objective advice and the hard earned 'insider secrets' that you will find invaluable in making the right CRM vendor decision. Getting Customer Relationship Management right is a goal to which any customer focused company aspires. Yet, rather than enabling companies to achieve this goal, the complexity of choosing the right CRM vendor can become a stumbling block to companies trying to deliver excellence in customer service. With an increasing choice of established, corporate vendors, niche vendors and open source solutions, your decision to invest in CRM is vital in supporting the business information that underpins your delivery of sales, marketing and service excellence to your customers. Having led many CRM implementations as a consultant, and in his current role helping CRM consulting firms and vendors of CRM add-on applications develop solutions relevant to customer needs, Andrew Schultz is a solution architect with deep experience in understanding customer requirements and mapping those requirements to CRM functionality.